Hosted by comedian Tom Papa, this quiz show combines drama and high stakes with comedy in a trivia-charged, slime-soaked entertainment blast. A team of three can win up to $500,000. In the game, three players must answer six questions (varying in value from $5,000 to $50,000 each) and are offered multiple correct answers and one incorrect answer. Working under a 30-60 second time limit, one player is chosen to cut wires on a “bomb” that correspond to the different answers. If a correct answer wire is cut, the game goes on. Once all of the correct wires are cut, the team banks the money for that question. 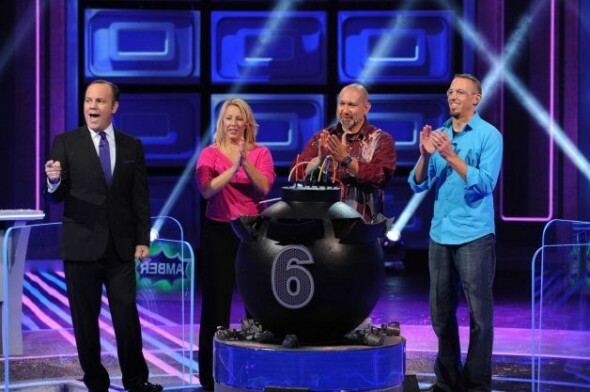 If a wrong answer wire is cut or time runs out, the bomb explodes with goo, the contestant is eliminated and the team receives no money. If two players are eliminated, the remaining player must answer the remaining questions. If the player answers one incorrectly, the game is over and the team leaves empty-handed. If all of the questions are answered correctly, the team can take the money they’ve accumulated (up to $125,000) or risk half of their winnings for the Mega Money Bomb questions. If they answer it correctly, they can quadruple their prize earnings. For the Mega Money Bomb, there are 10 wires. Seven correspond to correct answers and three correspond to incorrect answers. The team has 90 seconds to cut all seven correct answer wires. If an incorrect wire is cut or they run out of time, the bomb explodes and the team loses the money they wagered. Episode #10 — It’s the Refried Beans Bomb! What do you think? Do you like the Boom! TV show? Do you think it should be cancelled or renewed for another season? can u tell me if u are airing boom anynore?id love to see more shows of it.please let me know the new season dates. I want to see BOOM! Renewed please. Please let us see more of BOOM! I like the game show Boom! We love this show so PLEASE keep on airing it. I Love BOOM! Renew it for another season !!!! I love watching boom it is my family time with my kids. A reindeer is faster than a elk the reindeer50 mph the elk 45 mph so she was right!!! Renew Boom for another season! It probably will be cancelled before you even try to get on the show. Ratings continue to slide. How do you become a contestant on BOOM????? BOOM should be brought back ; and given a different name — The fact that boom is reminiscent of a bomb should be of no concern . Have they stopped making action pictures because someone gets shot ? I t was a fantastic show with a fantastic host and gave a hardworking man or women a chance to have a better life .